Having beautiful, straight teeth is important for your self-confidence, and it’s also important for your oral health. And now, thanks to Invisalign®, you can have those beautiful, straight teeth without the hassles of traditional braces. 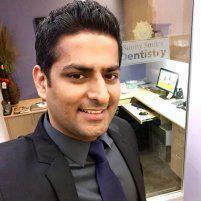 As a top-rated dentist in Gilroy, California, Dr. Sandaldeep Singh at Sunny Smiles Dentistry, loves helping teens and adults improve their smiles with state-of-the-art Invisalign treatments. To find out if you’re a good candidate for Invisalign, call the office or schedule your appointment online. Invisalign is an orthodontic system that helps teens and adults correct alignment issues without the use of traditional metal or ceramic braces. Instead, the Invisalign system uses a series of clear plastic trays or aligners to move teeth into their correct position. The trays are removable, and their clear plastic design means they’re virtually invisible while you’re wearing them. What types of alignment issues can be corrected with Invisalign? Invisalign offers aligners that are ideal for adults as well as teens whose adult teeth have not finished erupting. Once Dr. Singh has evaluated your teeth and determined that Invisalign is a good choice for you, your treatment begins with X-rays, pictures, and impressions of your teeth. These provide important information that helps ensure your aligners fit your mouth perfectly. Your aligners are made at a dental lab that specializes in Invisalign aligner fabrication. At the lab, the impressions are scanned into a computer that uses computer-aided design and manufacturing (CAD/CAM) technology to create a series of virtual models of your teeth that show how your teeth need to move during treatment. Then your aligners are made using those models, so they fit securely and comfortably. The number of aligners you’ll need depends on the issues that are being corrected, but most people need at least 10-12 sets. What benefits does Invisalign offer compared to traditional braces? What happens during treatment with the Invisalign system? After your aligners are made, you wear each set of aligners for about two weeks then you’ll exchange that set for the next set in the series so your teeth continue to move in the right directions. During treatment, you can expect to visit the office about every six weeks to check on your progress.